The Eighth Doctor Adventures has certainly never been a range that shies away from celebrating the past and continuity of Doctor Who, but as it adopts the stylings of the modern television series with a yuletide episode following a monumental climax that previous stories had led up to, ‘Relative Dimensions’ delves farther into the televised and audio continuity than ever before. As the Doctor’s granddaughter, Susan, and her son, Alex, come aboard the TARDIS for a Christmas dinner, they soon find themselves in the presence of a strange spectre that blurs past, present, and future. Attempting to fulfill his desire to provide Lucie with a nice Christmas following the debacle that resulted in ‘Death in Blackpool,’ the Doctor invites Susan and Alex to join them for Christmas dinner, the surprising revelation of the Doctor having a family certainly something that is not lost upon Lucie. ‘Relative Dimensions’ ends up being a very personal and intimate affair set almost exclusively within the TARDIS, and so Susan and Alex make a most welcome addition following the introductory events of last year’s Big Finish Bonus Release ‘An Earthly Child.’ Indeed, their presence brings out a specific sentimental and protective side of the Doctor not really seen since Susan initially left the TARDIS so many years ago, and though it’s clear that he would love for Alex to travel with him, it’s even more intriguing to see how much the Doctor wants Alex to be like him as he furtively tests telepathic abilities and DNA. The presence of Alex also allows for superb continued development of Susan who is no longer the frightened young girl trying to keep up with and impress her grandfather but who is instead a mature mother with true responsibility that drives her every thought and action. This marked contrast between who Susan has become and who the Doctor, in essence, remains is wonderfully presented and works all the more effectively since the First Doctor was the driving force for these changes and lack of changes alike to take place. It’s quite clear that the Doctor is not one who is suited for any sort of traditional domestic life, and there’s a subtle wedge between the Doctor and his granddaughter regarding his desire to reconnect with his family more directly that adds a great degree of nuance and emotion to their scenes together. Thankfully, Alex has progressed quite a bit as a character as well since ‘An Earthly Child,’ and Jake McGann certainly seems more comfortable delivering his lines with the needed emotion. Presented here as a young man struggling to come to terms with his own identity and his Time Lord roots, he nonetheless has a clear plan to pursue architectural studies and proves to be quite an astute judge of character as he gets to know his great grandfather more personally. Lucie and he develop a natural rapport, and their decision to leave together to travel the world at the story’s end feels both earned and a nice bookend to Lucie’s enthusiasm for Christmas but unease about once more being on the TARDIS at the beginning of the story. As strong as the character drama is, ‘Relative Dimension’s also manages to tell an intriguing science fiction story that reaches into the far past with a memento from an early trip to Quinnis while also giving greater insight into just how the Doctor manages to handle so many close friends leaving him time and time again over the years. While the notion of a pandimensional, pantemporal fish may seem laughable, it serves its purpose of uniting the characters while also bringing out their differences marvellously. 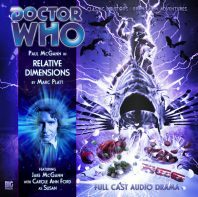 With four strong performances, evocative holiday sound design, and crisp direction, ‘Relative Dimensions’ is both a solid Christmas outing and a solid episode in its own right, opening up plenty of new dramatic pathways for the remaining three stories in this series along the way.